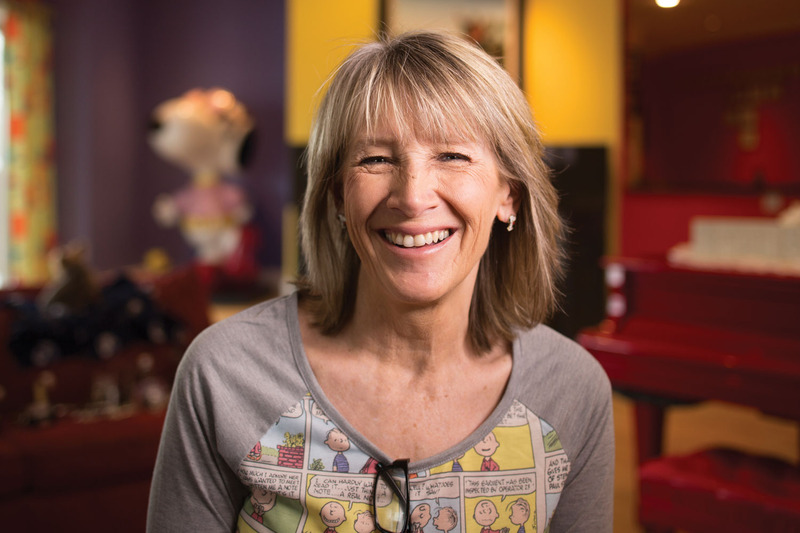 Peanuts characters pop up all over Amy Schulz Johnson’s home and, now that she’s back at BYU, in some of her assignments. Photo by Brad Slade. As a daughter of Peanuts creator Charles M. Schulz, Amy Schulz Johnson (’20) inspired a comic or two. Like the one in which Linus, proselyting about the Great Pumpkin, gets doors slammed in his face. Her father signed a personal copy of that strip, “For John and Amy, who know what it’s like,” says Amy—a nod to her and husband John B. Johnson’s (BA ’88) days tracting as young missionaries in England. “All I had to do to join the Church was buy a dress,” she jokes—her home life was family oriented, no drinking or smoking. Her father, though not a member, supported her decisions to be baptized at 22, serve a mission, marry, and attend BYU. Now, after a long hiatus raising nine children, Johnson is back to finish a degree, bringing a zaniness and passion imbued in her childhood. In actuality, it’s Johnson who takes after a Peanuts character: her favorite, Pig-Pen. If there’s one way she’s like her dad, Johnson says it’s her “all-in neurosis.” She remembers telling Schulz—who did all the idea-generation, drawing, and lettering of his 18,000 strips alone—“Dad, you’re obsessed.” But in her parenting and in her studies, she’s got the same compulsion. “I obsessively read books about the English language now,” she says. Johnson has even become “e-mail buddies” with one of her textbook authors, David Crystal, who uses her dad’s comics in his books. “Crystal is like the PR agent for linguistics,” says linguistics professor Cynthia L. Hallen (BA ’80, MA ’82)—comparing him to the Stephen Hawking of physics. Johnson approaches her studies with intensity and boundless enthusiasm say her professors. For instance, she’s joined Hallen at the front of the class to dance and sing. She makes treats for “the kids” in her class every semester—chocolate Peanuts characters last fall in honor of the new Peanuts movie. She even brought her missionary-daughter’s giant stuffed dolphin, Dave, along to Hallen’s office hours one day (she was documenting Dave’s day at BYU to make her daughter laugh).